The CF-20 comes with a detachable backlit keyboard and military grade casing for outdoors use. The tablet part features a 10.1-inch touchscreen and an upgraded i5-7Y57 CPU coupled with up to 16 GB of DDR3L-1866 RAM. Panasonic’s Touchbook CF-20 is probably the only fully rugged detachable 2-in-1 Windows 10 notebook on the market today. Since there is no competition in this sector, Panasonic has not updated this model once since its release… up until now, that is. The Toughbook CF-20 is keeping the original size, with a 10.1-inch 1920 x 1200 screen tablet and a detachable keyboard to match, but it does get an upgraded Intel i5-7Y57 dual-core/quad-thread CPU clocked at 1.20 GHz (3.3 GHz turbo) with 4 MB cache, which integrates an HD Graphics 615 GPU. Complementing the CPU are 8 or 16 GB of DDR3L-1866 RAM and a 256 GB SSD, to which users can add an optional OPAL encrypted removable 512 GB SSD. The tablet part integrates a 1080p webcam and an 8 MP sensor on the back, while the IPS touchscreen features high brightness levels of up to 800 cd/ m². Since Panasonic is marketing these to representatives of law enforcement, the updated CF-20 model now includes a magnetic stripe reader for driving licenses and membership cards and users can operate the touchscreen even when they wear gloves. 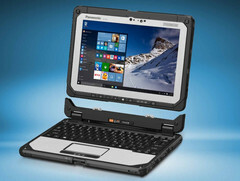 The new Toughbook CF-20 will begin shipping in early March with an MSRP of around US$3,100.